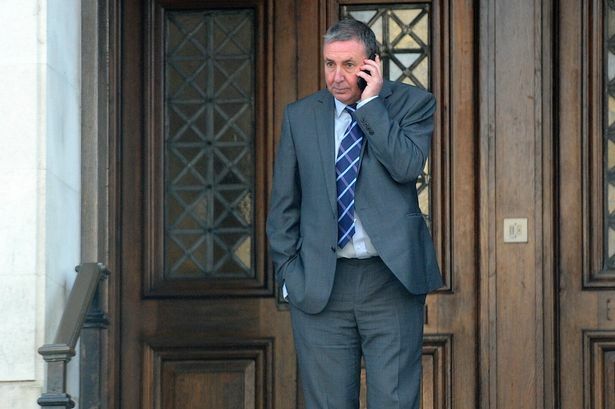 An alleged benefits cheat who claimed he was so ill he could barely walk 50m was a champion golfer who played on an 18-hole course, a court heard. Alan Bannister, 54, who has a handicap of six, pocketed more than £26,000 in higher rate Disability Living Allowance after complaining he was in constant pain seven days a week, it is alleged. On a claim form he said he struggled to raise his hands above his shoulders and it took him up to quarter of an hour to walk just 50 yards, Cardiff Crown Court heard. But the jury saw footage which allegedly showed Bannister pushing a golf trolley laden with clubs around the 5,400-yard course for more than four hours, without any difficulty. Bannister, from Barry, Wales, who has a form of chronic arthritis, denies theft and fraud and insists doctors told him to stay mobile to alleviate his symptoms. But the prosecution claims he lied about the seriousness of his illness and was not entitled to claim a payment usually reserved for people who cannot walk. On Tuesday, Stuart McLeese, prosecuting, said Bannister had plenty of chances between 2004 and 2012 to tell the Department for Work and Pensions his circumstances had changed. He said: “He made dishonest representations about the extent of his needs. “He failed to notify the Department for Work and Pensions about his care and mobility needs. “He did not accurately reflect the extent of his condition upon him while filling in claims forms and did not notify the department of any changes in his condition. “On a claim form he said he could not walk 50 metres before feeling severe discomfort and that would take him 10 to 15 minutes to do so. Mr McLeese said in 2004 Bannister joined St Andrews Major Golf Club in the Vale of Glamorgan and went on to have a handicap of six. “For those who may not know, Mr Bannister was a pretty good golfer,” he added. The Department of Work and Pensions investigator Andrew Holland decided to covertly film Bannister after receiving an anonymous tip off. The footage showed the defendant teeing off from the first hole as well as approaching the 18th hole green, reports Wales Online. Mr Holland said he saw Bannister tee off from the first hole with what appeared to be a “400 yard drive up the fairway”. The court heard Bannister has ankylosing spondylitis – a chronic form of arthritis. Bannister’s defence is that he would only play golf when taking pain killers and when his condition had not flared up. He has pleaded not guilty to failing to disclose information to the Department For Work and Pensions and obtaining money transfers totalling £26,090 by deception between October 2004 and July 2012.